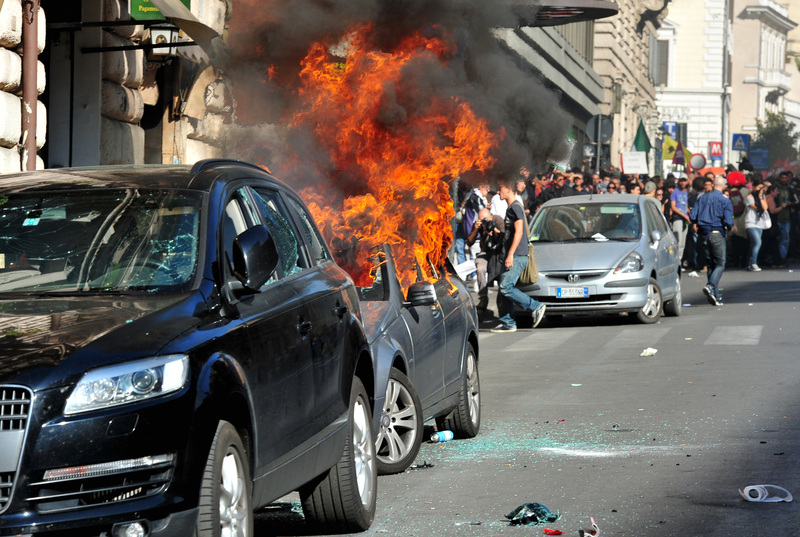 Rome's mayor said Sunday that it could cost at least a euro1 million ($1.4 million) to recover from the havoc wreaked by rioters who smashed windows, tore up sidewalks and torched vehicles after breaking off from a peaceful protest. The hundreds of rioters infiltrated a march Saturday by tens of thousands of demonstrators unhappy about the global financial crisis - part of a worldwide version of the Occupy Wall Street protests in New York. The protesters, some wearing gas masks and many in hoods, ripped up cobblestones and slabs of sidewalk to hurl at police and buildings, and smashed windows with hammers. Police responded with water hoses and tear gas. Protesters also stormed into a church, tore a crucifix off the wall and smashed a statue of the Virgin Mary. Rome Mayor Gianni Alemanno inspected the damaged neighborhood near St. John in Lateran Basilica on Sunday. He called the rioters "animals" and told reporters that repairs to city property, including streets and sidewalks, will cost at least euro1 million ($1.4 million). Interior Minister Roberto Maroni, whose ministry includes the state police corps, said he would brief the Senate on Tuesday about the rioting and the measures to be taken to avoid a replay. Maroni told a news conference that he has urged investigators to "carefully study the images" that might have been captured by bank and other surveillance cameras so the rioters could be brought to justice "and pay for what they did in an exemplary way." A city sanitation crew on Sunday whitewashed a wall near the Colosseum to remove graffiti. Charred hulks of dozens of parked, unoccupied cars set ablaze by the rioters still lined several streets, but most of the shattered glass and chunks of hurled stone had been swept away Saturday night. Hundreds of bus runs on Saturday had to be diverted to avoid the riot areas, but routes were normal on Sunday. Cafes in the area that had quickly shuttered their windows when the riot moved in their direction were open for business Sunday.